This expandable trivet is way more well-rounded than the standard one-note trivet. It transforms into various shapes that assist you while as well as when dinner is served. 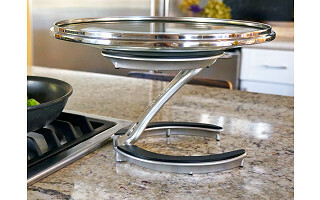 At the stove, let Trivae hold your lid to free up your hands at the stove. When the food is ready, turn it into a single or double trivet, or use it as a stand to display finished meals or free up table space. We particularly appreciate its clever engineering, solid construction, and sturdy material. It slickly morphs into different shapes for your cooking and serving needs. Its rings are lined with heat-resistant silicone and the sturdy zinc composite body holds up to 10 pounds. Trivae was designed by three friends who dusted off their inventors’ notebooks and started their first venture. They wanted to create something that would keep countertops safe from burns or scratches. Trivae does that, plus it folds down flat into a compact ring to store. Hello everyone! I’m Svetlana Zhitnitsky, one of the Co-Founders and inventors of Trivae. As a long time Grommet fan myself, I’m very proud and excited to introduce Trivae to the Grommet community. I’m happy to answer any questions or hear any feedback you may have! Great looking product and it looks like something I would use but I have to say the price to me too much. @Lisa Thank you so much for your comments and feedback. Trivae is made of a durable cast metal and is hand-finished, to create this high quality and beautiful product. It is designed to hold up to 10 lbs of weight so it supports even your heaviest cast iron or crock pot lids and also doubles as a display stand and dual size trivet so takes the place of multiple tools. It's so handy that it will not sit unused in your drawer! It’s also the perfect gift item. I agree - useful product but the price point is way too high. @Bonnie we really appreciate your feedback! Trivae is a high quality, durable tool that is as functional as it is eye-catching. It holds even your heaviest lids and keeps your counters clean, your fingers safe and saves you time in clean up. It's an all around quality tool. I was so excited when I saw this, but honestly, the price for this great trivet is way above what I would pay. Too bad cuz great idea. Thanks so much Barb! We have spent a lot of time making Trivae into a product that is both beautiful and functional. Its high quality, hand finish is at home in any kitchen. It's extremely durable and designed to hold up to 10 lbs of weight (great for all your lids). It also goes with you from the kitchen to the table or wherever you serve your food, turning from a lid holder into a display stand, a small trivet or a long trivet, all with a few clicks. I have to agree....I wanted one of these until I saw the price. Even at half price its still high. Such a shame, it is a wonderful idea but I can easily live without it too. Ready to buy it until I saw the price. We understand it may not be in the price wheelhouse for everyone, but would be getting a high-quality addition to your kitchen. As Svetlana and our testers here at The Grommet say, it's durable and functional. It holds heavy lids and keeps your counters clean, your fingers safe and saves you time in clean up. doesn't matter high quality- still to much money. Price is always going to be subjective, Luci. We just wanted to let people know the reason for the higher price. Congratulations on a great product. What an ingenious idea. I was ready to buy a few but the price is more than I want to pay. Thanks for the kind words, Cathleen. Maybe just buy one then? I agree with the comments below. I also was going to buy it but even at half its too expensive. At $20 for sure $30 it would be a maybe. Just because it could be used many ways doesn't mean we should pay extra for each use. Well with increased functionality comes increased price. We do appreciate your DIY spirit! I love kitchen gadgets that make life easier. This looked wonderful, but I have to agree with the other comments, the price point is way too high. I'll continue to put my lids in the sink and use my $5 trivets for hot pots and plates. I hope you find a way to bring the price point down! Good Luck! Thanks, Cynthia. We understand where you are coming from. We appreciate the comment. such a cool idea, but whoa...way too much. maybe if it was made in stainless? titanium? Thanks very much for checking us out and for your kind words Christopher! We've invested a lot of time into making Trivae a product that is well designed, imminently functional and beautiful at the same time. It's made of a cast aluminum/zinc composite that is designed to hold up to 10 lbs. Perfect for all lids as well as platters, pizzas, cakes and anything else you might want to elevate for serving. Great for cooking, entertaining and gifts for many occasions such as weddings and housewarmings, just to name a few! It looks like a great product, but I agree with everyone else - way too high of a price. Hi Janine, unfortunately, great products are going to come at a cost. And as Svetlana outlines above the durability, functionality, and materials used determine that. i purchase many items from this website but in this case, price point is too high. I agree with other comments. No one is going to want or like every single Grommet. I echo the sentiments of everyone else. This is elegant and functional. I always watch the product videos, then ask myself, how much would I pay for it? Like others, I was thinking in the $20-$30 price point, or $40 at the most. Good luck; I hope you're able to bring the cost down. Thanks for the comment, Greg, and for checking out the videos. Unfortunately, one thing the video doesn't get to in too much detail is the materials used, which plays a large role in the determined price. @Mike I suggest that you make it out of different materials and maybe add some color. I was going to buy this, but I would not pay $80. I thought it would be $30-40. If you take your great design and just make it out of something different, I'm in. And I suggest red color. At that point, Deborah, you're getting a different product more in line what is already out there. Which is fine, but we want to support more innovative products that separate themselves from the pack which Trivae does. Eyes bugged out when I saw the price. Interesting idea, but nope. Even the discounted price on Amazon for the red one is a little too high. Hi Lisa, to give you an idea for why the price is what it is, check out the comments from Svetlana and I above. The durability, functionality, and elegance all play a part. You certainly get what you pay for. I was very impressed by the appearance and versatility of this product and was considering a purchase. But I caught my breath when I saw the price. It may be very well made, durable, and has multi-use versatility, but the price is way beyond my further consideration. We totally get it, Brenda. It's not going to be in everyone's budget. Should you reconsider, just know that it is everything you describe so it would be a worthwhile purchase. Looks like a very well-designed product--multi-functional, sturdy, compact for storage, AND attractive. However: the price. There is no tool or small appliance in my kitchen that I payed $80 for, nor would I. The price is the deal-breaker. It is all of the things you described, Joanne, which is why it is the price it is. Such a product is not cheap to make or buy. It looks like a perfect wedding or shower gift, something nice that will last a long time. Yes, yes, a million times yes, Ellen. @Mike I come here for you as well, Mike, I like the way you roll! Have to agree with everyone else here, I really like the concept and was ready to buy -- until I saw the price. $80 is way to high for a trivet. Thanks very much for your comments Molly! 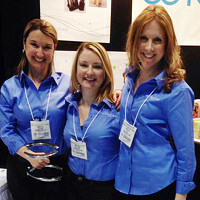 Trivae is so much more than just a trivet, it's really a 4 in 1 tool that goes with your from the kitchen to the table! A lid holder to keep your cooking surfaces, clean, your fingers safe from burns when grabbing lids, saves time with kitchen clean up. Then it doubles as a display stand for anything you might want to elevate for serving (up to 10 lbs). Add to that a small trivet and a large trivet for cooking sheets, casseroles or two dishes at once. What you get is a high quality, durable product that you reach for again and again. Hi Marcia, yes we offer a 1-year limited warranty against manufacturing defects! I am concerned about the durability of this expensive gadget. The first review on Amazon (Guy in NoVA on September 1, 2016) tells of an early model from the Kickstarter campaign failing with a hot cast iron lid being thrust directly towards his wife who was cooking hot food on the stove at the time. He also supplied pictures in his review which shows the Trivae falling apart (unlevel and loose hinges) after a few months use. Have you addressed this customers issues? What have you done to improve the product since that time? Hi Walter, thanks very much pointing that out. We strive to provide outstanding customer service and our Kickstarter backers are near and dear to us especially since they helped us bring this really great product to market. While we strive to make every product perfect, that is unfortunately not feasible in the nature of the manufacturing process. As much as we strive to avoid them, product defects do happen occasionally and that is what happened in the case of that backer. We replaced his unit immediately after he notified us, advising him that unfortunately he received a unit that did not meet the high quality standards we strive for. To date, we have seen a very small number of those and stand by the high quality of the product we offer. Even so, we have proactively made some small modifications in the design that makes the product even more durable. I hope that helps to allay any concerns and thanks again for commenting! I have to agree with many of the other comments. We realize that a lot of money went into the design and manufacture, but wouldn't it be better to sell 50 at a lesser price than 10 at the current price? Still love Grommet and have purchased many products that I otherwise would not have known about. This one is great, but it won't be coming to my home at the current price. Thanks very much for your thoughts Leah, we understand that the price is not in everyone's budget and really appreciate your compliments on the product! Like everyone else says...the price is unreal! And let's be honest; it only serves ONE additional function that a traditional trivet can't serve...lid holder. @David I like all, of the others above, love the idea but hate the price. I realize that you attribute the price to the cost of the materials, however, I don't think that many people will be interested because the cost is steep. Perhaps it could be made from a different material. Thanks David, we know that the price is not for everyone and appreciate your comments. Hi Evelyn, we appreciate the interest and input and as Svetlana and I have said, we know it may not be in the price range of some, but we've sold a few dozen so we know there is buying interest from a good amount of people. Thanks again for the comment. @Mike - Appears there is concensus that this price is way too high. While I can appreciate the trial & error time this took before final concept, that cost should be made up in volume - not by gouging - THIS IS A TRIVET! Seriously, before I would pay even 1/3 of this price - I would simply put the lid back on the pan - or hold it. I've noticed lots of your items being extremely overpriced suddenly - and lots appear to be mere copies of what's already in the marketplace at a much higher price. Kinda removing the "innovation" aspect from your site - as well as "affordability. Seems like you are only catering to the high-end 1% - good luck with that - because few if any of them cook on a regular basis. Hi Joann, price is always going to be subjective. And as I've said, not every Grommet is going to be for everyone. This one is not for you and that is completely fine. Our site is a microcosm of the state of innovation today. Over 90% of patents filed are for reiterations of products on the market. That doesn't make them any less innovative. Nice looking Trivet or Lid holder. I had hoped the Trivae wold allow me to put the pot on the lower part and use the elevated part to also hold the lid. Since that configuration was not shown thought why would I want a trivet or lid holder I'll pass. then I saw the price. We did consider that configuration in development and indeed it's possible to place certain types of pans on the bottom while in Z-shape (a rectangular platter for instance). This works well when you're using it for display stand purposes so that you have a tiered display, more so than if you're trying to use it as a trivet for the bottom ring and lid holder for the top. Thanks for the feedback, we're always finding new potential uses! I know there is a large start-up cost for a product like this and I think it is a great idea, but as other have said, the price is way too high. In economic terms, you may find that you can increase the volume of sales enough by lowering the price so that your total revenue would be the same as selling a few items at a higher price. Please consider what a lower cost would do to your sales volume. I have read every comment. They are all positive about the product, positive about this website , but negative on the price point. I have also read every reply from Svetlana and Mike. Every reply is the same - great product, lots of development effort, and not in everyone's price range. So, the conclusion is a stalemate. They are satisfied with selling less product at a higher price, and we the customers [who should be your focus] are complaining about the price. @Adolfo Agreed. Love the design, like the idea. Would be attractive on a counter. But I can't justify $80 for a trivet. Thanks Adolfo! Feedback is always invaluable to us and we truly appreciate your taking the time to comment! @Barbara, Trivae is so much more than just a trivet, it's really a 4 in 1 tool that goes with your from the kitchen to the table! A lid holder to keep your cooking surfaces, clean, your fingers safe from burns when grabbing lids, saves time with kitchen clean up. Then it doubles as a display stand for anything you might want to elevate for serving (up to 10 lbs). Add to that a small trivet and a large trivet for cooking sheets, casseroles or two dishes at once. What you get is a high quality, durable product that you reach for again and again. This expandable trivet is way more well-rounded than the standard one-note trivet. It transforms into various shapes that assist you while as well as when dinner is served. 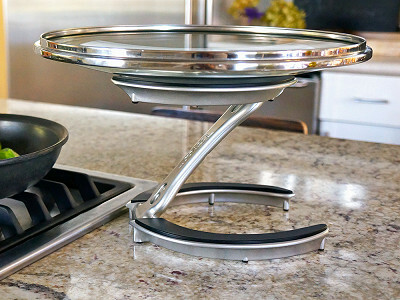 At the stove, let Trivae hold your lid to free up your hands at the stove. When the food is ready, turn it into a single or double trivet, or use it as a stand to display finished meals or free up table space. We particularly appreciate its clever engineering, solid construction, and sturdy material. It slickly morphs into different shapes for your cooking and serving needs. Its rings are lined with heat-resistant silicone and the sturdy zinc composite body holds up to 10 pounds.